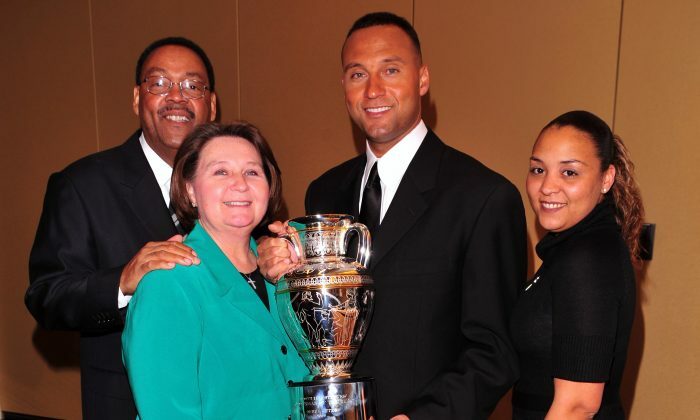 Derek Jeter’s sister, mother, and father are being searched for as the New York Yankees legend retires. Check out info and pictures of Derek’s sister Sharlee, father Charles, and mother Dorothy below. Sharlee is one of Derek’s best friends as well as his younger sister. She’s also the mother of his nephew Jalen, who is two years old. The boy’s father isn’t around much, and hasn’t been publicized–Derek is a father figure in his life. Sharlee was engaged once to the rapper Skyzoo, but they split in 2010 before getting married. Skyzoo is speculated as Jalen’s father. Sharlee serves as the president of Turn 2 Foundation, which Derek and Charles started to try to get younger persons to stay away from drugs and alcohol. The foundation was started in 1996. Sharlee began dedicating herself to the work when she turned 18, even working during breaks when she was at college. After she graduated, she was gradually promoted until she became president. In fact, just days ago she was posting photos from the foundation’s annual baseball clinic in New York City. “Dr. Sampson Davis, Author of Living and Dying in Brick City: An E.R. Doctor Returns Home, spoke to more than 100 young people this afternoon as part of day 3 of the clinic,” she shared. Sharlee had her own sports ambitions once upon a time, when she was a softball star at Kalamazoo Central High School in Michigan. Derek’s father helped Derek a lot in his life, with Derek emphasizing that he got a lot of good advice and support from him. “My dad is very positive, very optimistic,” Jeter told the NY Daily News. Derek’s father was there when Derek made his big league debut in 1995, and his dad also serves on the board of directors for the Turn 2 Foundation. Both Charles and Dorothy regularly attend home games. “We think of things that have happened with Derek back in Little League, and to see him now progress as a ballplayer, as a man, we’re always in that parent mode,” Dr. Jeter said. Charles completed his master’s degree at Western Michigan before getting his doctorate in sociology. He was a substance abuse counselor for a while. Charles met Dorothy when he was serving in Frankfurt, Germany in 1972. They married a year later. And he passed on the baseball skills to his son–Charles played shortstop at Fisk University in Nashville, Tennessee. Dorothy was also a big and positive influence in Derek’y life. ESPN reported that she made both Derek and Sharlee sign a contract that outlined what was required of them in terms of schoolwork, curfew times, and abstaining from drugs and alcohol. “Derek had goals, but he knew if he wanted to play in the Little League all-star game or go to baseball camp, he better come home with a 4.0, he better have his behavior intact, or he better make curfew or he wasn’t going anywhere,” she said in the book Derek Jeter Surefire Shortstop. Dorothy is of Irish descent. Dorothy enjoys watching her son play, often attending home games. She also serves at the Turn 2 Foundation as treasurer.